I really loved the animation in this new series. It was so much brighter and cleaner than the original series. Some of the scenes were simply breathtaking! I thought that the introduction of each character framed with roses was really interesting, and it seemed reminiscent of a Greek chorus. I was quite impressed by all of the rose imagery! The rose is, of course, symbolic of the Sun and of the Heart. It actually seems like this series may be more explicitly metaphysical than the first series was! It is interesting that the Princess archetype is shown from the very beginning! It seems from the previews that Sailor Mercury will emerge in the next episode, so I wonder if this series will move a bit quicker though the main story. We are not helpless girls who need men’s protection. We are not frail weaklings whose only existence is of being protected. I am sure that the more advanced Japanese scholars on this site can do a better job of translation; however, even with my feeble efforts, one can see how very different the tone of the Japanese is. After reading the actual Japanese lyrics, my main worry has subsided. That worry was that the series would lose the deep metaphysical wisdom that was present in the original series in favor of feminist rhetoric concerning the relationships between individual males and females. In watching the episode, my worry was eased quite a bit, and the series has potential to be even more explicit about metaphysical truths than the first series. Despite my grumpiness about the theme song, I really did like the first episode, and I look forward to seeing more. This is SO exciting, isn’t it? I really enjoyed the first episode of the new Sailor Moon. It was SO pretty! I watched it with English subtitles and without subtitles. My Japanese is not good enough to understand much without subtitles, and the English subtitles were chotto…. I hope that we will be able to find Japanese subtitles somewhere. Wouldn’t that be exciting? I actually never read the Sailor Moon manga. Maybe I can find it in Japanese somewhere. This looks like a bad year for Precure. First Happiness Charge, the weakest series since the franchise began and now Sailor Moon Crystal, a serious rival in the Magical Girl sentai field. Sailor Moon was the first show to merge the Magical Girl genre with the Senshi genre, creating the Magical Girl Senshi – of which Pretty Cure is the latest and most successful example. Sailor Moon Crystal is said to follow the manga much more closely than the original anime did, although the first episode is very similar to the original anime because the two did not start seriously diverging until the second episode. I found myself noticing more things seeing it in Japanese. Things as simple as (I guess you all realized this already) Usagi-chan’s name is 月野 うさぎ Tsukino Usagi, which with those kanji for the surname means something like Moonfield Usagi. However it can easily be read as 月のウサギ tsuki no usagi = Moon-rabbit. Rabbits are very closely associated with the moon in Japan. In moon-viewing season the rabbit motif is everywhere, so this association must be immediate and obvious to a Japanese audience. 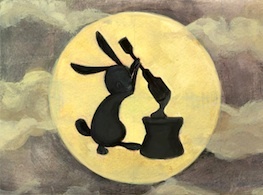 The actual idea behind the Moon Rabbit is that the markings on the moon show a rabbit pounding rice to make mochi. 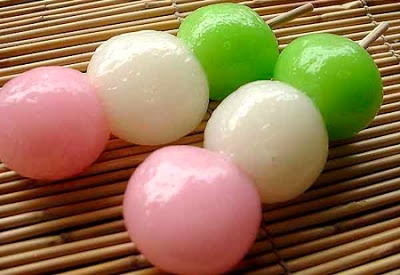 This kind of pounded rice (mochiko) is also used to make (o)dango the cute traditional candy-balls on skewers. And – Usagi-chan’s characteristic hairstyle, which is also used in her Sailor Moon and Princess Serenity identities is playfully termed odango throughout the series. In fact hairstyles of this general type are nowadays called odango styles, entirely because of Sailor Moon. Neat, ne? As to the anime – I am loving it. The art-style seems to me reminiscent of mid-20th-century girls-book art and the animation is just wonderful. Really looking forward to the next episode. Honored Cure Tsukiakari, I really wouldn’t worry about Sailor moon taking the tangled and frozen path of recent Disney. This way of thinking really hardly exists in Japan and would definitely not make for a successful series. Your rendering of the song (which is in song-speak rather than making exact logical sense) is closer than the Hulu one. 存在 by the way means “being” (concrete noun) rather than “existence” (abstract noun) here. It is the noun modified by か弱い, so I would say it means “we are not frail beings who are merely protected”. These sentiments seem perfectly fine to me. I can see how they could feel a bit suspect in the light of a very particular Western tendency toward agressive anti-feminity. But that tendency, fortunately, really does not exist in the Japanese mainstream. Honored Cure Yasashiku, introducing sailor Mercury in the second episode follows the manga. Yes it should be somewhat faster-paced than the original anime as the manga told the story more concisely. Honored Cure Kiyoku, good news! The Japanese subtitles are now available, and you can find them here. The art and animation really are gorgeous, aren’t they. While I doubt if we can expect any surprises, since the series appears to be going to follow the manga faithfully, this really is just delightful. I just saw the second episode, and I like it a lot! How exciting that there are Japanese subtitles available. I have obtained the Sailor Moon manga in Japanese, and Sailor Moon Crystal really does seem to be following the manga VERY closely. It is fun to be reading the manga along with the series! Before I get to the point, I want to thank the writers of this blog. It is a very happy place for me, and I am ever-excited to discover anything new or that I have overlooked on this wonderful site. I even enjoy rereading, and often! The viewpoints on life, on living, on language, on television is so refreshing. It makes me feel recharged and lighter having perused the articles available here. Because of this blog, I began watching Pretty Cure/Precure, and because of this post, though I only discovered it in January 2015, I began watching Sailor Moon Crystal. While I have not been able to finish the first Precure series, I find myself completely charmed by Sailor Moon. I never expected to like it as much as I do, and I suspect that I likely would never had as much appreciation for it as I would without this blog’s wonderful input fresh in my mind. To the writers here: you have quite honestly shaped my worldview. And I can’t thank you enough for that. You’ve made me a better, happier, kinder person with a brighter outlook on the future and nature of life itself through your writing. My only fear now is that I will seem to exaggerate, and I assure anyone seeing this comment that it is 100% truth. I wish I could give something back to this beautiful haven on the web. In that light, I’d like to comment more often on the blogs I read, in the hopes of assuring each of them, including this Happy Innocent WordPress, that I love what they write and I hope daily for more. Also in that light, I would love to know if any of you lovely writers have continued watching Sailor Moon Crystal? If you have, what else have you thought about it? Favourites, dislikes, etc.? Even if no one has continued watching the show, it would make me extremely happy to see what else has been going through the minds of these much more enlightened beings than myself. Honored Miss Stephens, you have no idea how happy your comment makes us. Really it was to bring more happiness and innocence into the world and encourage those who need it that we started this blog. We have been quiet here for quite a while (perhaps partly because this year’s Precure has not been the most wonderful). We have certainly been watching Sailor Moon Crystal. I see every episode as soon as the Japanese subtitles come out (sadly I can’t understand enough without subtitles still). The first story arc has just ended and I am wildly excited about Chibi Usagi‐chan. We haven’t all died and gone to Akihabara. The main contributors for this site have been very busy over at Kawaii Japanese, which I realize isn’t of great interest if you aren’t learning Japanese. But of course our philosophy of life goes into our thinking about Japanese studies too. Right now I am turning my experiences in Japan (first blogged on this site) into a book, and today have been working on a video about one of my visits to a maid cafe in connection with the book. We are not really enlightened beings, just humble travelers enjoying the flowers along the way. But it is kind of you to say so. Your kindness is very much appreciated. Honored Miss Stephens, thank you so much for your kind words. I am glad that you have appreciated our blog. Comments like yours are really, really encouraging! Yes, I have continued with Sailor Moon Crystal, and I really love it. I have also been reading the manga (in Japanese), and I listen to the episodes over and over again as part of my Japanese listening practice. The first Precure series, Futari wa Precure, is not really the best of them. I watched it, but there are others that are much, much better, I think. As Cure Dolly said, this year’s Precure, Happiness Charge Precure, is well…. It is ok, and I have been watching, but there has not really been much that has inspired any articles. From the Senshi point of view, the four best Precure have been Heartcatch, Suite, Smile, and DokiDoki. Suite is really good, but the first 7 episodes are a bit difficult, because there is a lot of bickering between the girls. It is an exploration of harmony and disharmony, so it is necessary to the story…it is just hard to get through. The bickering does get better though, and it turns out to be really, really good, I think!